My great-grandparents were German, and so was our next-door neighbour when I was a kid. We got to taste the yummiest cakes and breads, and see beautiful decorations we'd never come across anywhere else. A lot of our modern Christmas traditions originated in Germany, did you know that? Like advent calendars, and Christmas trees, and gingerbread houses. Silent Night is German. 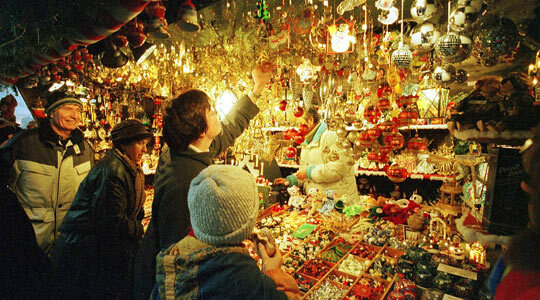 The first commercially produced decorations were German, too. It's a big deal over there, and I love the massive participation. 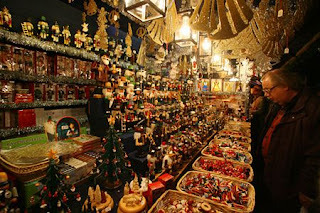 Christmas markets can be found in many major towns and the most famous is in Nuremberg. How amazing would it be to go shopping here? I love Christmas in Australia, don't get me wrong -- but this would be truly magical. Just once. Please, Santa? Those pictures are truly beautiful, may I please save them for bookmarks? (ha ha I'm a hamburger...), but raised in Australia and I'm sad now that I realise my mum never told me how beautiful Christmas in Germany is, nor any of the stories or legends there must be. I do remember some really pretty tree ornaments that mum said were German. Tiny birds with real fluffy feathers and tiny fake candles, both had peg type clips to attach them to the branches. I hope Santa is paying attention - and isn't too busy cancelling all those naughty kids' orders. I love the 'Santa won't come' threats flying all around the place at this time of year!! One of my best friends spent her teen years living in germany, and another is a German expat. Hearing them speak of Christmas in Germany, and all the traditions makes me want to visit. The photos are gorgeous! That looks lovely. It would be wonderful to visit at Christmastime. K. I got a plan. And it's a damn good one. You Fabio and the precious ones, Sand John Hamed and I. Germany Xmas 2 years from now. White Christmas, sleigh rides egg nog the lot. 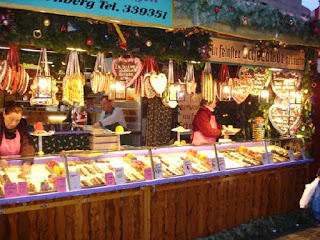 I spent Christmas in Germany in 2007 via a Rhine River cruise I booked through Uniworld (http://www.uniworld.com/Holiday-Season-River-Cruises). In 2008 I took the Danube River cruise with the same company. They were the best Christmases I've had since childhood ones spent in Germany. I would HIGHLY recommend them, even if you have to save all year, give up chocolate, cigs, and beer to pay for it. It was wonderful to just unpack once and then wake every morning in a new magical city! I went Christmas week both times, but would recommend the week prior since many of the holiday markets end on the 23rd or 24th. The boats only hold about 100 passengers, so the first year there were just 49 of us 'strangers' who became 'family' by the end of the cruise. thank you Cindi!! that's great information. I have a friend who did a Danube cruise a couple of years ago and she LOVED it, so that's something definitely worth looking at. 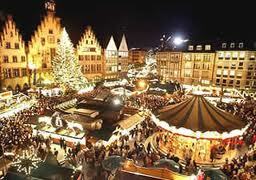 My sisters and I have decided we're working towards Christmas in Germany in two years time. Yay for you!!! I know you will love it! Check with companies to find out about advance purchase discounts. I know that Uniworld offered a discount to me, but since I was traveling alone, it didn't amount to much because I had to pay for a double stateroom - so about one and three-quarters people. With the family going, your per person cost will be lower. Consider the least expensive staterooms if you are going on a river cruise. They all have private baths, and you will spend most of the time in them just sleeping. There is a lounge and bar on board apart from the dining room where you spend most of the cruising time when not in town. my Christmas was blue. How about yours? WOO to the snowy HOO!! now that's a good swear!